World Earth Day is celebrated on April 22 every year. Earth Day is an annual event created to celebrate the planet’s environment and raise public awareness about pollution. Planting more and more trees is the more powerful and affordable ways to make personal and social difference for the environment. Plantation reduces environment pollution. It is an educational activity to do with team members. Master Piece Crafts Foundation Team did the Environmental Awareness Program along with team members. The venue was Jaunapur Village in Delhi. The program started at 8:00 A.M in the morning. Master Piece Crafts spreaded the green word amongst the people and raised awareness about benefits of plantation and reducing pollution. Such activities needs to be done as often as possible. By celebrating Earth Day, we wanted to send message to the society that it is easy to plan, take out time and planting trees. This minority women artisan group named “Koshish” with 50 artisan members comes from different family background, some women are married & some are unmarried. They are not much educated and their families are dependent on them as they are the only source of income and their families are not very financially strong. These women artisans makes products like Embroidered Boxes, Bags, Photo Frames, Ornaments, Jewelry and Wall Arts etc. Women Artisans does the handwork with passion & zeal and at the same time, they also hide their inner feeling and thinking which keeps on running in their mind which they do not share with anyone. In this picture Arti Sharma, Founder & CEO of Master Piece Crafts trying to understand their personal matters and addressing their future plans. World Earth Day is celebrated on April 22 every year. Earth Day is an annual event created to celebrate the planet’s environment and raise public awareness about pollution. Earth Day aims to encourage people across the world to be more environmentally friendly. First time, the world earth day was celebrated in the year 1970 and then started celebrating annually on global basis by almost 192 countries. By not creating air pollution, noise pollution and water pollution. By planting more and more trees. By supporting our government picking up the wastes from the streets, parks, localities etc. and keep your surrounding clean. Recycling and reuse of old materials. Conserving the energy by practical means. Guide people every day to take care of mother earth. 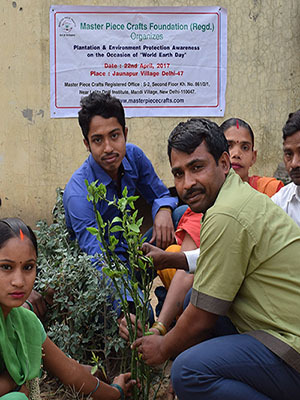 After the Seminar, our team along with Artisan partners and local people planted 20 tree seedlings in the village. The local people supported and vowed that they will take care the seedlings and make it larger trees.